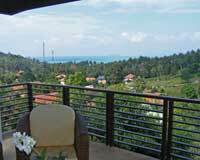 Beautiful 2 bedroom villa comfortably furnished and with sea views. From the villa you can walk to the beach and local restaurants. The villa, situated on the lower, gentler slopes of the hills of Santi Thani has been thoughtfully and uniquely designed to take full advantage of the magnificent views, to capture the cooling sea breezes and to maximize outside living. From the upper terrace the view is across a forest of coconut palms towards the ever changing colours of the waters of the Gulf and many distant surrounding islands. On the first level is a fully equipped kitchen and an entrance hall with outside breakfast patio and dining area on the terrace. Also on this level is a double bedroom with en suite bathroom, air conditioning and French glass door leading to the terrace with a private sun terrace area and small pool. The second floor houses a lounge complete and the second double bedroom, with air conditioning and en suite bathroom, opening out to the spacious terrace with ocean views. Baan Faan is ideal for honeymooners, 2 couples sharing, or a family of 4. Its setting, design and facilities will bring a feeling of harmony and relaxation. Wifi is available on request. A reliable company provides the service for the villa with their service team on site. 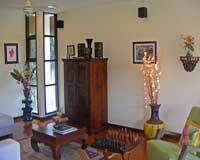 Guests will be greeted after their arrival and then we aim to visit every couple of days. The cleaning team, gardeners and pool care will take care of their duties according to their work schedule. This is a friendly established community with discreet onsite security. There is a mix of rental houses and permanent residents in the neighbourhood. The villas are individually designed by the owners to maximise privacy. In the Bang Por area there are some fantastic restaurants catering to western and thai tastes. At the main road there are Songtaews [bus type vans with bench seats] that do to all the main villages round the island. We can also arrange car hire or taxis as required. 2 Bedrooms 01.05. - 30.06. 01.07. - 30.09. 01.12. - 14.12. Babies welcome but the villa is not suitable for children ages 2-12 due to the high balconies and open pool. For inquiries, contact: wolfgang@samuihouserentals.com - please name the house you are interested in.